Overview: The Tuareg are a Berber people with a traditionally nomadic pastoralist lifestyle. They are the principal inhabitants of the Saharan interior of North Africa. The Tuareq languages represent a family of closely related languages and dialects, most typically referred to as Tamasheq. Most Tuareg live in the Saharan parts of Niger and Mali, but constantly move across national borders. 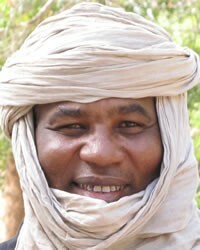 Small groups of Tuareg are found in southeastern Algerian, southwestern Libya, northern Burkina Faso, and northern Nigeria.